He was born Gregory Edward Page on October 25, 1958 in Louisville, KY. At the age of 12, his father, a former boxer himself took him to the gym for the first time. He proved to have natural talent in the sweet science of boxing. At the age of 16 he had the opportunity to spar with his idol Muhammad Ali. In the mid to late 70’s he took the boxing world by storm; Golden Gloves, AAU, Boxer of the year and finished his amateur career at 94-11. In 1978, he turned pro and his first pro fight held in Louisville, KY in February 1979, he dispatched his first opponent in the 2ndround and his pro career was well on its way. 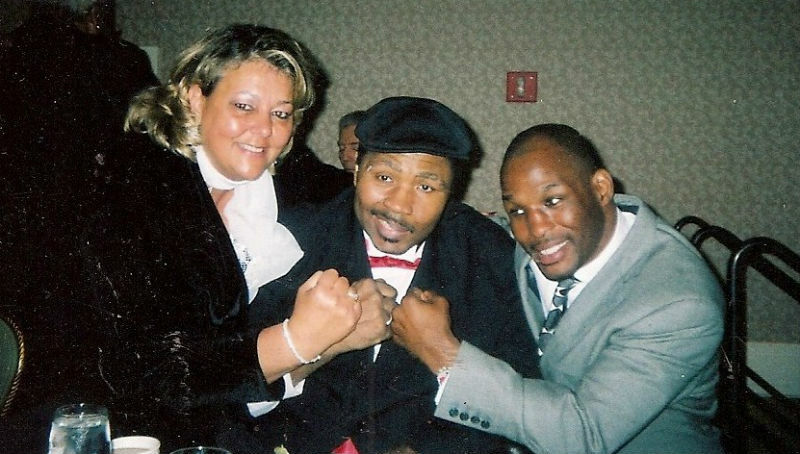 From 1980 to 1984 he was the United States Boxing Association (USBA now IBF) heavyweight champ. In December 1984, he stunned the world by defeating Gerrie Coetzee in South Africa to become the World Boxing Association (WBA) heavyweight champ. He would finish his pro career with a record of 58-47-1 (48 KO). However, perhaps he will be best known for how his career would end. On March 9, 2001 in a comeback attempt, he fought Dale Crowe in Erlanger, KY. Greg went down at the end of the fight with what would later be diagnosed as a subdural hematoma (bleed on his brain.) The fight, sanctioned by the Kentucky Athletic Commission (KAC) would later be the subject of a lawsuit and the change in how the world would view the boxing scene. The KAC would be criticized for allowing the fights to go on without oxygen, and a physician who was not licensed to practice in the state and no ambulance onsite. After a long delay, he would eventually undergo surgery to remove building pressure from the bleeding on his brain; but by that time he would suffer a massive stroke. After many weeks in the hospital, Greg would spend much of the next few years in Rehab learning to eat and even dress himself again. However, the stroke had left him paralyzed on his left side and in a wheelchair that he called “his Cadillac”. For the next eight and a half years, Greg would suffer numerous illnesses that would ultimately lead to his death on April 27, 2009 at his home in Louisville, KY. I want the world to know that Greg was an amazing man. He felt all along that GOD was using him and his brain injury for a special purpose. He never complained and he dealt with the brain injury and debilitating illnesses with the strength, courage and determination, what we like to call the fighting spirit! Greg had a great sense of humor and a loving and giving heart. I thank GOD every daythat he chose me to walk that final journey with Greg. I learned so much from his courage. Several months after his initial injury, Greg placed a mantel on me to make sure that this type of accident never happens to anyone again. I have worked hard to keep that promise I made to him. By participating in the studies at the BU CSTE, we are doing that. Perhaps this participation is Greg’s legacy after all.